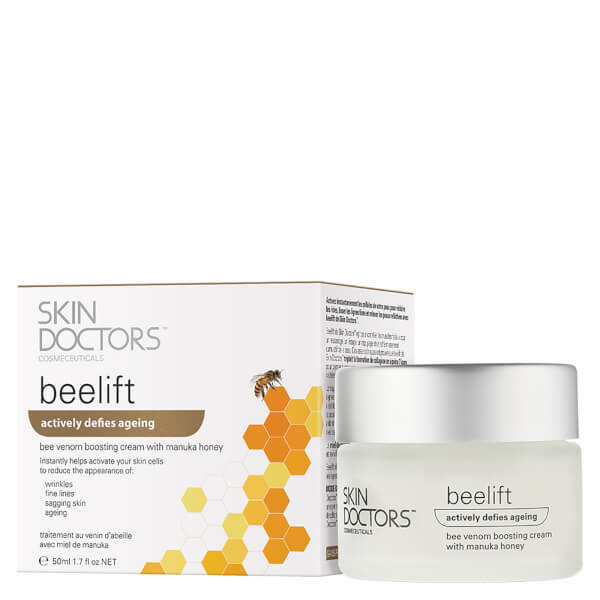 Combat signs of premature ageing with the Beelift from Skin Doctors; an innovative face cream that utilises powerful ingredients straight from the hive to nourish and revitalise skin. The luxurious age-defying moisturiser combines a complex blend of antioxidant-rich Manuka Honey, hydrating Royal Jelly and the Bee Venom compound Melittin, which works to mimic the effects of a bee sting by appearing to control facial muscles and create a tightening effect. Advanced collagen booster Trylagen® and moisturising Hyadisine® infuse skin with triple action peptides, proteins and essential amino acids, effectively hydrating skin and stimulating natural collagen levels to leave skin feeling plumper and rejuvenated. Suitable for all skin types, it reveals a softened and smoother looking complexion with the appearance of fine lines and wrinkles visibly reduced. Free from parabens. Bee friendly. Not tested on animals. Not suitable for those allergic to bees stings. Cleanse face thoroughly and pat dry. 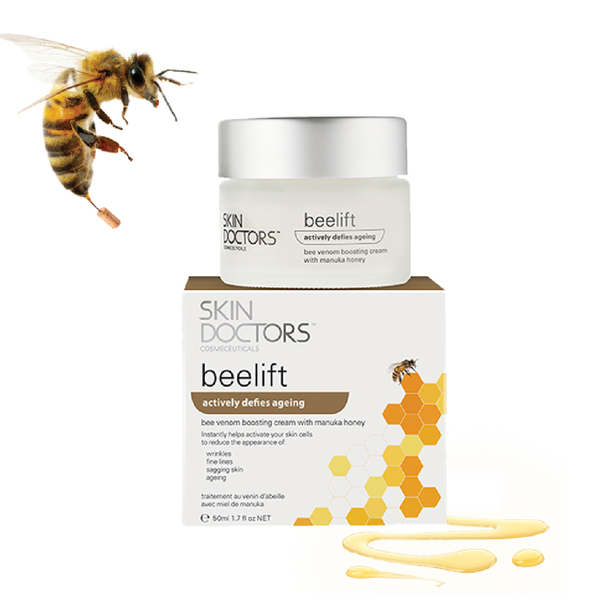 With dry fingertips, apply a small amount of Beelift cream to your face and décolletage, avoiding eye area. Water (Aqua), Ethylhexyl Methoxycinnamate, Isopropyl Myristate, Butylene Glycol, Glyceryl Stearate, Dimethicone, Cetearyl Alcohol, Cyclopentasiloxane, Menthyl Lactate, Pseudoalteromonas Ferment Extract, Honey (Mel), Hydrolyzed Wheat Protein, Hydrolyzed SoyProtein, Glycerin, Xanthan Gum, Lecithin, Pseudoalteromonas Exopolysaccharides, Honey Extract (Mel Extract), Camellia Sinensis Leaf, Extract, Royal Jelly Extract,Tripeptide-10 Citrulline, Carbomer, Tripeptide-1, Bee Venom, PEG-20 Stearate, Phenyl Trimethicone, PEG-100 Stearate, Ceteareth-20, Caprylyl Glycol, PEG/PPG-18/18 Dimethicone, Stearyl Alcohol, Disodium EDTA, Citric Acid, Lactic acid, Parfum, Phenoxyethanol, Sodium Salicylate, Sodium Benzoate, Triethanolamine, Potassium Sorbate.